The Museum opened in 1933 as the Kyoto Enthronement Memorial Museum of Art in Kyotoʼs Okazaki district, itself an expression of the cityʼs modern trends at the time. The establishment of the Museum owes much to the generous support of many local citizens. 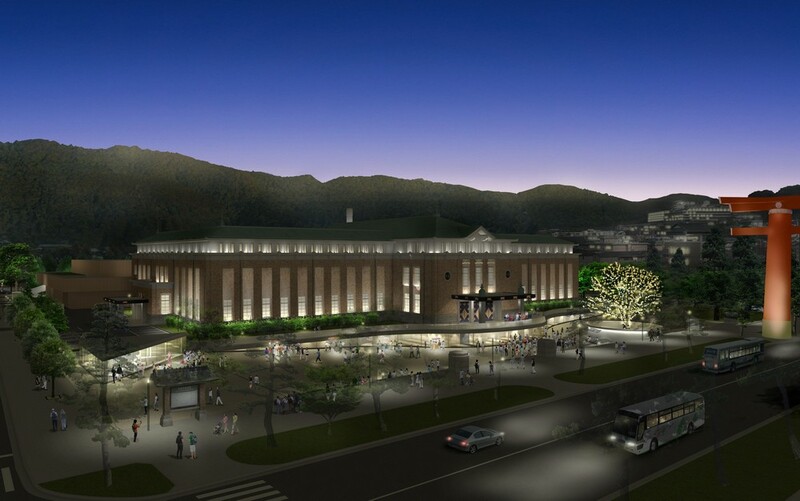 It was renamed as the Kyoto Municipal Museum of Art after World War II. As Japanʼs oldest public art museum housed in its original architecture, its classical visage standing against the backdrop of Higashiyama has been highly appreciated for 85 years. 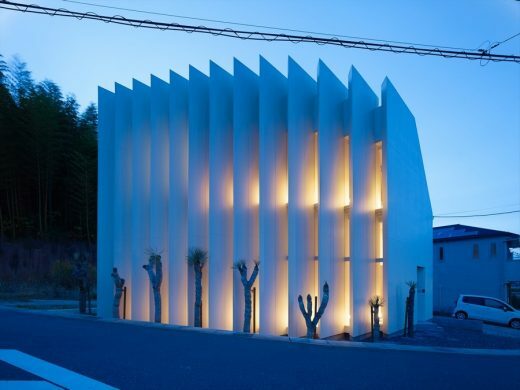 The innovative concepts of Aoki Jun and Nishizawa Tezzo, two leading Japanese architects, for the Museum renewal project preserved original elements while introducing new designs, allowing for a fusion of old and new to create a fresh image for the Museum. This renewal project has sought to address issues related to the structure of the Main Building dating from 1933 and, moreover, to achieve designation as a national cultural asset. We aimed to be a venue meeting all requirements to function as a museum in contemporary society while, to the extent possible, preserving historical architecture. 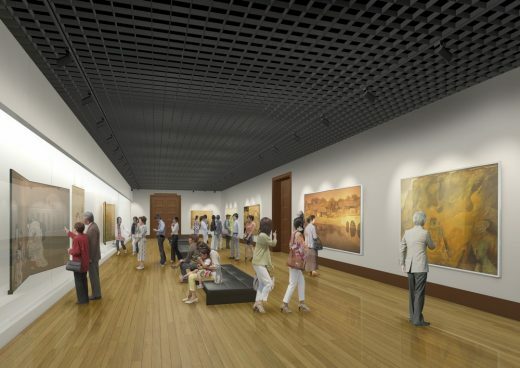 Our goal is to create a museum of art that will universally attract visitors and preserve a legacy for the future. 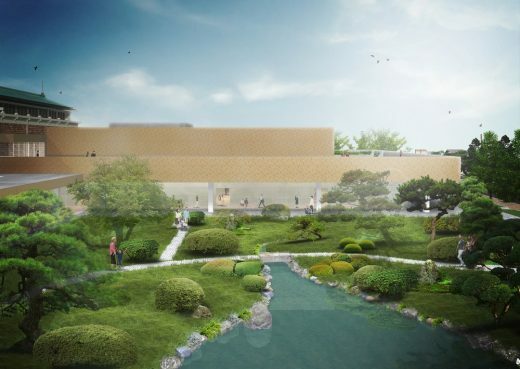 Looking forward to the opening scheduled for spring 2020, we are proud to now introduce all aspects of the architectural plan of the Kyoto City KYOCERA Museum of Art. The Main Building of the Museum is the oldest among Japanʼs existing public art museums. Completed in 1933, in the socalled Crown Imperial Style of architecture, it has been an important presence in Kyoto for more than 80 years. Though architecture itself does not move or change, the way people view and experience architecture does change with time. The multiple exposures presented by architecture create a rich manifold image. To respect that while renovating a structure to be suitable for the current age is highly important for the future. 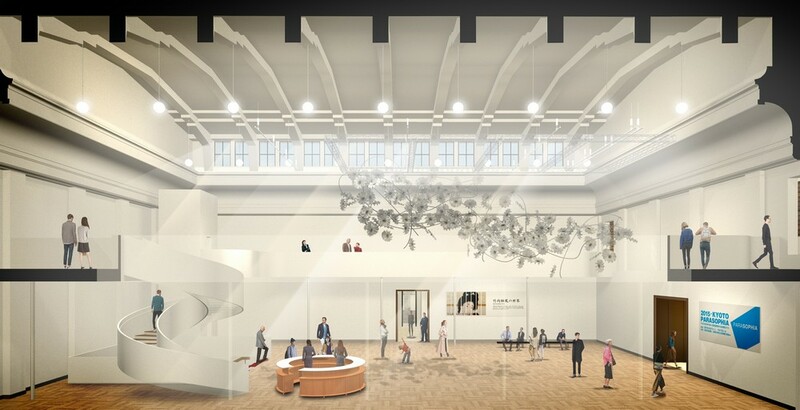 I am acutely aware of the significance and responsibility involved in the current large-scale renewal of the Museum. 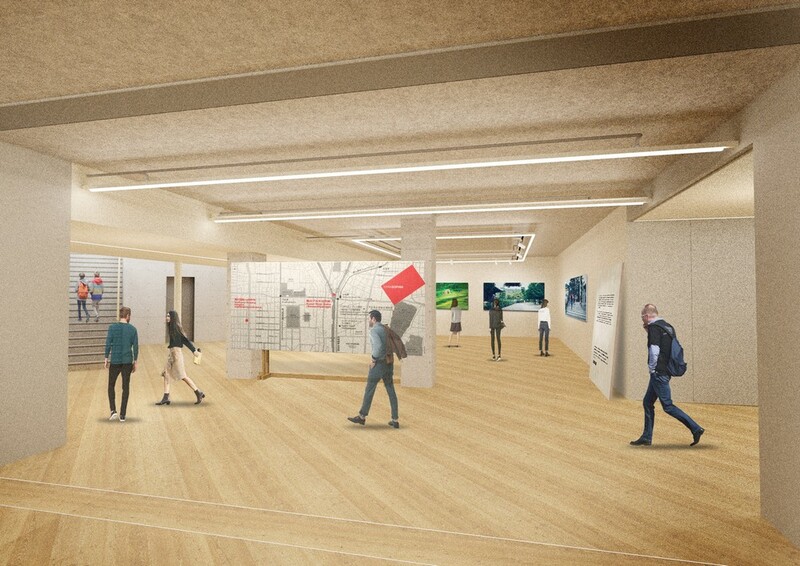 In going forward with the plan for the renewal of the Museum, we have sought continuity with the existing image while adding a new layer to that. My idea was to allow a new visage to emerge while preserving the underlying architecture. 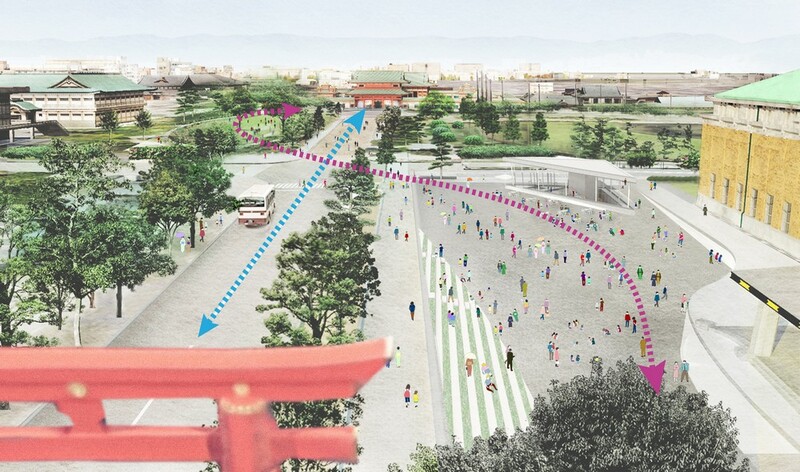 Among my priorities was to retain the open plaza area on the west side facing Jingumichi, and to strengthen the original axis that passes through the East Entrance to the Main Entrance. I first made a cut between the west side plaza and the main building and depressed the central foreground to make it a slope gently descending toward the center. In this way, the view of the main building seen from Jingu-michi remained while the entrance was moved from the first floor to the floor below. The cut was fitted with glass to make a new ʻglass ribbonʼ space for the museum shop and café. I created a grand staircase straight ahead of the underground entrance, going through the space that had previously been used for a ʻfootwear roomʼ and I inserted a strong axis extending straight from the east entrance Central Hall (previously a large display room) to the Japanese garden overlooking Higashiyama. I tried to draw out the Museumʼs embedded axis. In addition, we eliminated the facility equipment that occupied the north and south courtyards and returned the south courtyard to its original use as a courtyard. We covered the north courtyard with a glass roof, making it an indoor space. In this way, I tried to excavate certain of this Museumʼs possibilities that had been hidden for a while. In order to create a new exhibition room for contemporary art and a new facilities equipment room for the entire building, we had an extension (storage room) designed by Kawasaki Kiyoshi* rebuilt for the new building. I tried to keep a balance between eliminated and retained elements in the new building, such as the characteristic brick tiles of the Main Building and the large volume of the new building. By creating contrasts in this way between old and new, we have tried to achieve something more subtle and totally different from straightforward repair. 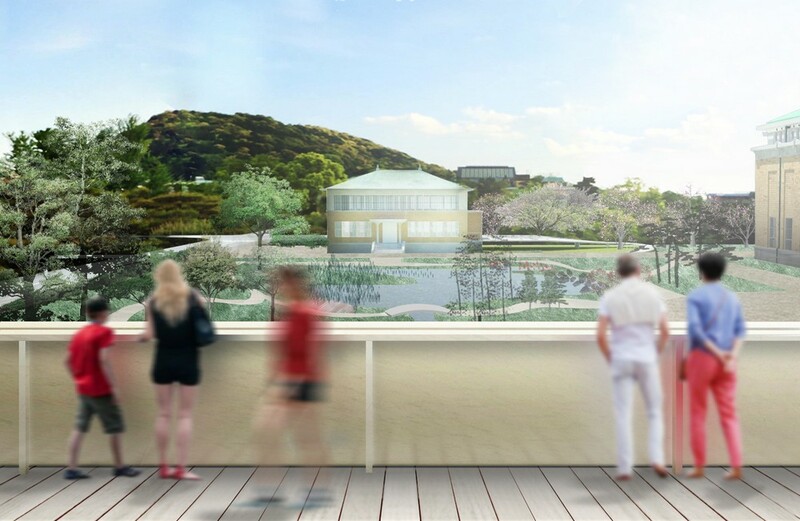 Located at the main entrance of the Museum in Kyotoʼs Okazaki district, a center of the cityʼs historical, cultural, and natural spaces, KYOCERA Square provides a landscape for people to gather, relax, and interact, to enjoy performances and events as well as exhibitions. The area is magnificent at night with the façade of the Main Building illuminated. For major events that incorporate the entire KYOCERA Square, audiences will be able to sit on the slope facing the Main Building façade, resulting in a view that integrates the space of the Museum and plaza. 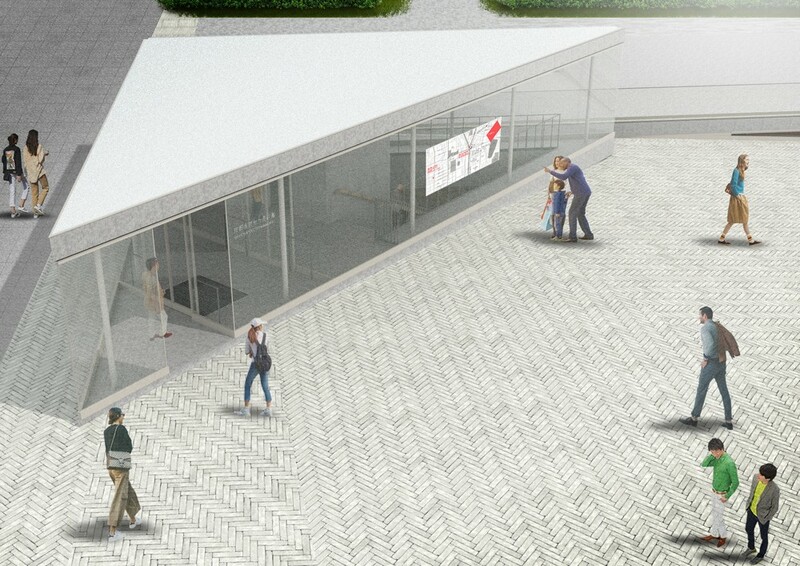 In front of KYOCERA Square, Glass Ribbon pre-eminently symbolizes the renewal project. Its light and transparent streamlined design showcases the fusion of new and historical architecture and also acts to interconnect the museum main entrance outside with the Museum shop and café inside. 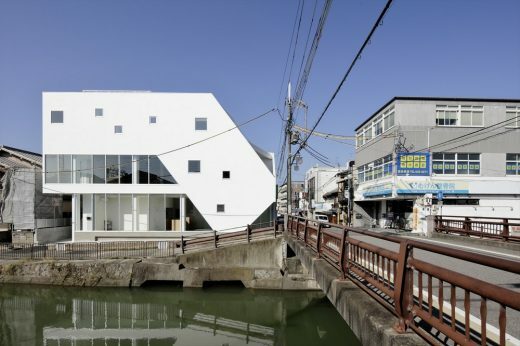 More broadly, it connects the Museum with the Okazaki district surroundings. 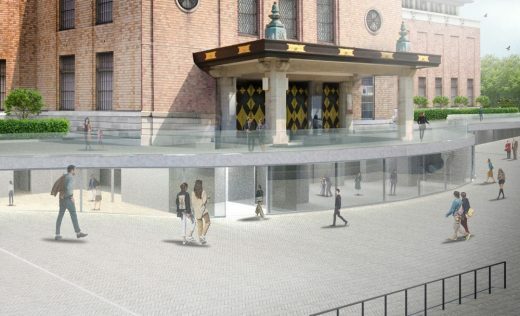 The facilities will be renewed and updated while classical design and historical elements dating from the time of the establishment of the building will be retained as much as possible. 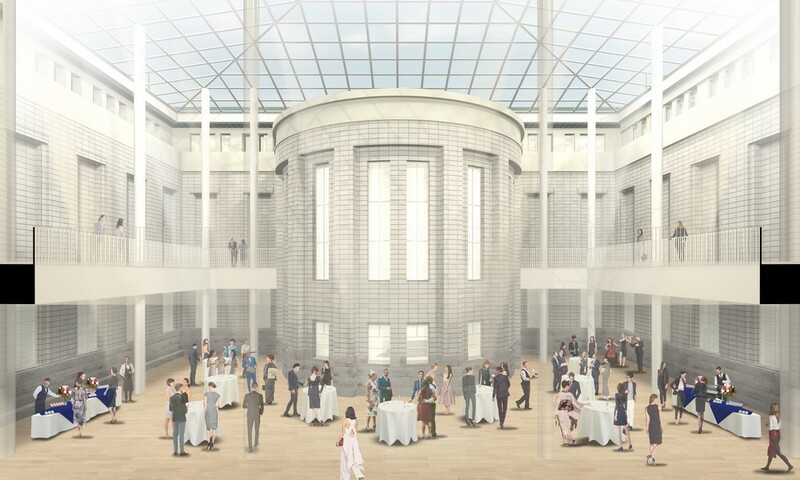 The first floor South Wing, a space of approximately 1000㎡, will be reserved for exhibition of art from the Museum collection, rotated along with the seasons. The second floor South Wing retains its original architecture and makes use of natural light. Curated exhibitions and exhibitions featuring exchanges with other museums, or international touring exhibitions, and group exhibitions will be held in the massive spaces of the second floor South Wing and the North Wing.